Amgen Korea’s Xgeva (ingredient: denosumab), a therapy for bone metastases from solid tumors that proved better efficacy than the conventional treatment, has recently gained insurance benefits in Korea. The reimbursement of Xgeva began this month for skeletal-related complications and giant cell tumor in patients with bone metastases from solid cancer. 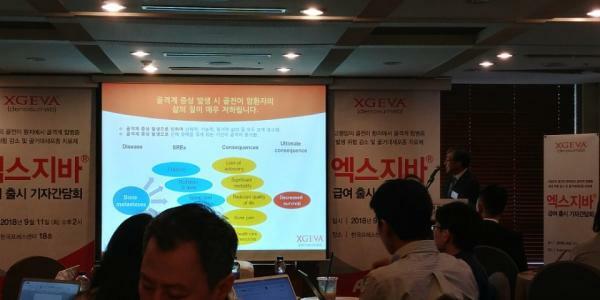 Amgen Korea holds a news conference on Xgeva at the Korea Press Center in downtown Seoul Tuesday. “Skeletal-related symptoms in patients suffering bone metastases from solid cancer lower the quality of life of the patient significantly. Xgeva showed better efficacy in reducing and delaying skeletal symptoms than conventional drugs in solid tumors with bone metastases,” said Ahn Jin-seok, a professor of hematology and oncology at Sungkyunkwan University’s School of Medicine, during a news conference by Amgen Korea at the Korea Press Center in Seoul, Tuesday. According to Ahn, the cure rate for skeletal complications is relatively low in Korea. “Patients with breast cancer and prostate cancer having a high risk of bone problems should be fully aware of skeletal complications. We should provide an environment where they can receive treatment of bone metastases immediately,” he said. Compared to the conventional treatment using zoledronic acid, Xgeva delayed the development of skeletal symptoms by 8.2 months. The new treatment also showed superior effectiveness in reducing multiple skeletal symptoms than zoledronic acid. Compared with the zoledronic acid-treated group, Xgeva-treated patients had an additional 23 percent decrease in the symptoms of the skeletal system in breast cancer, and an additional 18 percent in prostate cancer. “Patients with an experience of skeletal symptoms are at high risk for relapse. Breast cancer patients have the symptoms two to four times a year,” Ahn said. Insurance coverage for Xgeva is available for adults with breast cancer or prostate cancer with bone metastases who have to reduce the risk of skeletal symptoms. Amgen Korea said the therapy might obtain additional insurance coverage for other types of cancer. Additional reimbursement for patients with unresectable giant cell tumor will be a significant clinical benefit for patients with limited treatment options, she added. Kim Su-ah, medical director for Amgen Korea, said giant cell tumor was a rare disease that affects one per 1 million people. “Although disease causes frequent recurrences, severe pain, and deformations in bones and joints, reimbursable treatments have been limited,” Kim said. Xgeva is injected subcutaneously every four weeks. The insured treatment costs 249,800 won ($221) per bottle.